Frank Sinatra. The name evokes such imagery - dimmed lights, smoky air, a glass of bourbon, the smell of cigarettes, a cool flow of inside jokes and laughter. However in 1955 there was little of these to be found with regard to Frank. He was long past his bobby-soxer days, for the teenage girls who once screamed at him had instead outgrown him. Sinatra had divorced his first wife, Nancy, to marry Ava Gardner. This union didn’t last either. Sinatra’s career had taken a nosedive, and so had his personal life. What was he to do? Well, he did what Sinatra had always done best - he opened himself up for public consumption and released In the Wee Small Hours. In a way, this could conceivably be considered the first real concept album. The songs that follow are similar in tone and create the same mood as the title track. The song titles say it all: I Get Along Without You Very Well, I See Your Face Before Me, Last Night When We Were Young, I’ll Never Be The Same. The titles go on and on, thematically staying on the topic of loneliness, sorrow, and heartbreak. 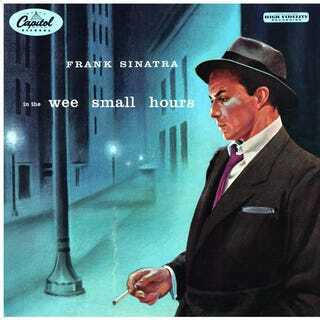 In the Wee Small Hours hearkens back to a time when you could be in a tavern or saloon, pouring out your woes to a bartender who would pour them back at you in a glass. The lights are down, there’s nobody around, you’re feeling low, and you think you’re at the end. While these are just a few examples of the songs from the album, I strongly urge you to give the entire album a listen. From beginning to end it evokes many emotions. So if you find yourself down about the end of a relationship, if you’re lonely, if you’re feeling that nobody knows what it’s like to be as down as you feel right now, give this album a listen. Have a drink with Frank Sinatra, and understand he’s been through it and came out on top. The same can happen to you.